Rainbow is made from a rainbow coloured, tie-dyed material with red button eyes and red fabric for his mouth. He has a white belly and a red tongue poking out from his mouth. He has a crest of material around his neck and a curly tail. This chameleon is a colorful fellow. Rainbow was made especially for you! Rainbow was released on 1st July 1998. His birthday is on 14th October 1997. There are two versions of Rainbow. 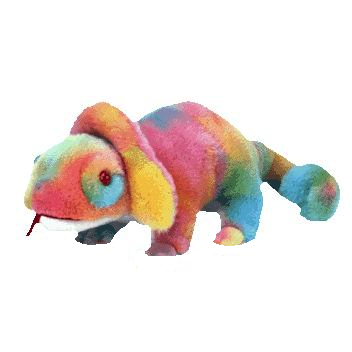 There is this rainbow tie-dyed chameleon with a red tongue and a blue version without a tongue. This variation came out a month before the blue version. Rainbow is very similar in appearance to Iggy the iguana. So much so that the Ty production team sometimes put an Iggy tush or swing tag on Rainbow and Rainbow swing or tush tags on Iggy by mistake. These errors are not rare so there is no value increase when they do occur. Rainbow retired on 1st September 1998.